NEWS: Suri's Thaksgiving in London! Suri Cruise is spending Thanksgiving with Tom! The 6-year-old left for London Tuesday to see her dad and enjoy the holiday with him. Tom, now filming “All You Need Is Kill” in the U.K., hasn’t seen his daughter in over three months. Tom Cruise sent his private jet to New York to pick up Suri – after getting ex-wife Katie Holmes ’ go-ahead for the 3,400-mile visit. A Jaguar whisked her away from Luton ­Airport on Tuesday to the ­5-star hotel, where he’d had a room ­painted pink specially for her. Suri’s toys were brought to the Home Counties establishment, where he had rented the entire west wing. The star, who hired four guards to protect her, also treated her to a visit to theme park Harry Potter World in ­Hertfordshire on Friday. The actor took time off from filming on Wednesday and Thursday to spend Thanksgiving with Suri. 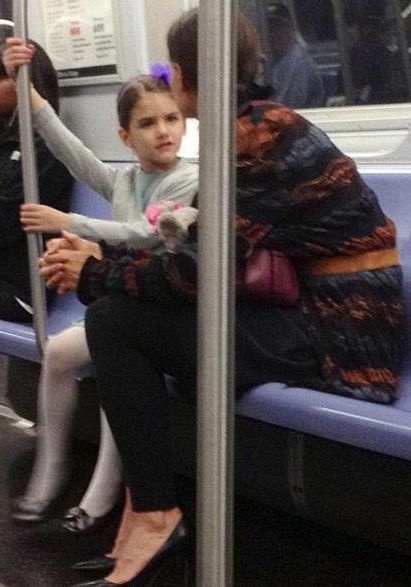 Suri & Katie took a subway and to gymnastics class at Chelsea Piers in NYC on November 18th 2012. Katie Holmes was chatty Cathy while appearing on Late Night with Jimmy Fallon to promote her Broadway play Dead Accounts. Suri's mom revealed that she'll be heading to Ohio to spend Thanksgiving with her family. outfit info: Lurex Knit Cardigan in Jewel by SEED, (first wore on October 4th 2009) and Contrast Sole Brown/Pink Boots FW'12 by Crewcuts (first seen on September 29th 2012). Suri & Katie went ice-skating to City Pond at Bryant Park NYC on November 17th 2012.
outfit info: Pink Puffer Coat FW'12 by Monnalisa (first seen on October 21st 2012) and Contrast Sole Brown/Pink Boots FW'12 by Crewcuts (first seen on September 29th 2012). Thanks to Elie for the pictures! Suri went to a doctor's appointment straight after school in NYC on November 16th 2012. 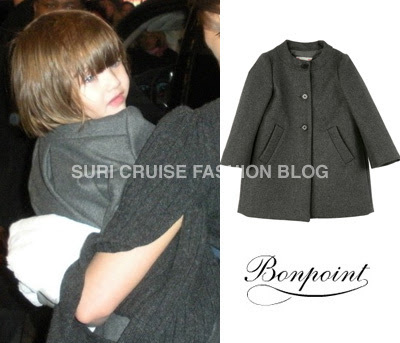 Suri was wearing Cashmere Star Button Cardinga in Heather FW'12 by Crewcuts. outfit info: Alyssa Mary Jane Shoes by Ralph Lauren and carrying a Pink Leopard Print Junior Backpack by GAP from her 1st day of School. Suri pictured out in NYC on November 14th2012. Suri was wearing Crazy Dot Printed Tights by Old Navy (sold-out). outfit info: Cupcake Dress in Aubergine FW'12 by Crewcuts (first seen on September 30th 2012) and Pink Glitter Ballet Flats FW'12 by Crewcuts (first seen on September 13th 2012), Balencia Boiled Wool Cloth Coat FW'08 by Bonpoint (first worn on Decmber 13th 2008). Suri pictured arriving to school in the morning and later - enjoying an after-school stroll with her classmates in NYC on November 12th 2012. 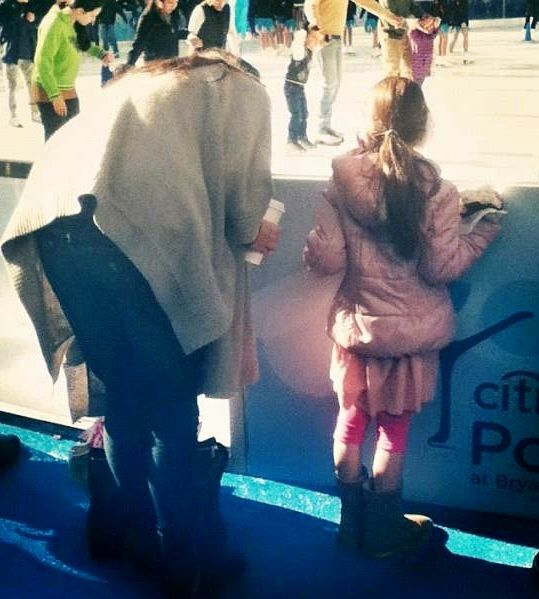 Suri & Katie indulged in some ice-scream, while out in NYC on November 11th 2012. Suri was wearing Violet Suede Utility Jacket SS'12 by Holmes & Yang (first seen on March 19th 2012), Red Glitter Minnie Mouse Shoes by Disney (first seen on November 2nd 2012), and Top by Zara Kids. Suri & Katie exited Music Box Theater and headed to dinner in NYC on November 10th 2012. Suri was wearing Vintage Dove Dress by Holmes & Yong, which she first wore on November 30th 2007. 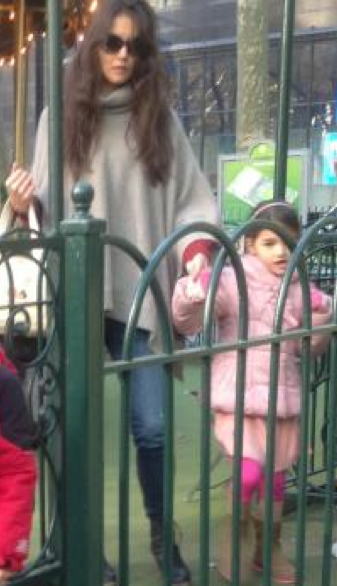 Suri enjoyed an after-school walk with her niece in NYC on November 9th 2012. Suri was wearing Burgundy Solid Tights from FW'12 by H&M for Unicef. outfit info: Pink Puffer Coat FW'12 by Monnalisa (first seen on October 21st 2012), Alyssa Mary Jane Shoes by Ralph Lauren and carrying a Pink Leopard Print Junior Backpack by GAP from her 1st day of School. Suri pictured arriving to school in NYC on November 7th 2012. 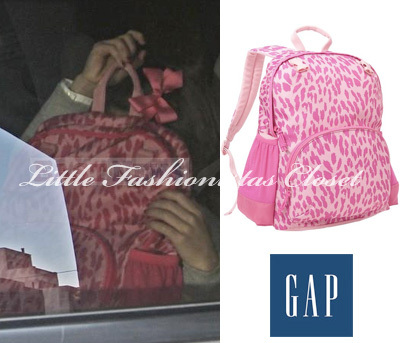 Suri was wearing Alyssa Mary Jane Shoes by Ralph Lauren and carrying a Pink Leopard Print Junior Backpack by GAP from her 1st day of School. Suri & Katie pictured out with friends in NYC on November 6th 2012.
accessorized with The Olivia Pink Rosettes Headband by Liv & Lily. Thanks to Melanie from Liv & Lily for Headband info! Suri and Katie arrived for "Dead Accounts" rehearsal at Music Box Theatre in NYC on November 3rd 2012.
outfit info: Addison Faux Fur Coat FW'12 by Milly Minis, Everyday Deep Violet Leggings by Crewcuts and Red Glitter Minnie Mouse Shoes by Disney, all first seen on November 2nd 2012. 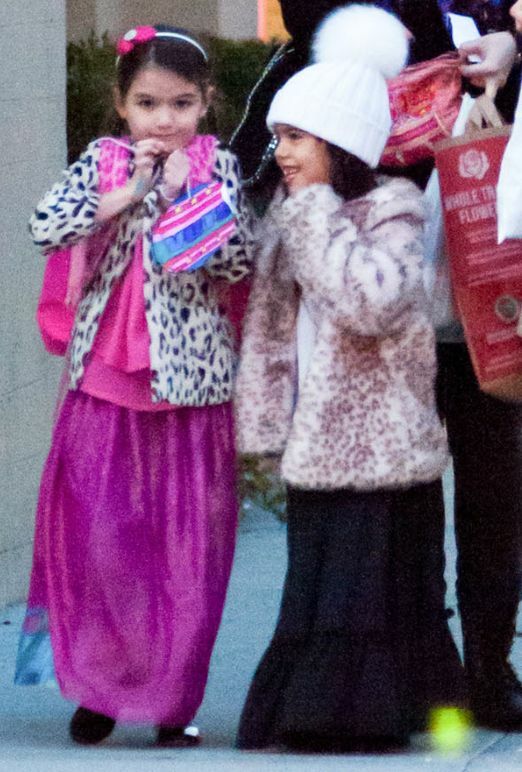 Suri & Katie were spotted outside Rockefeller Center in NYC on November 2nd 2012. 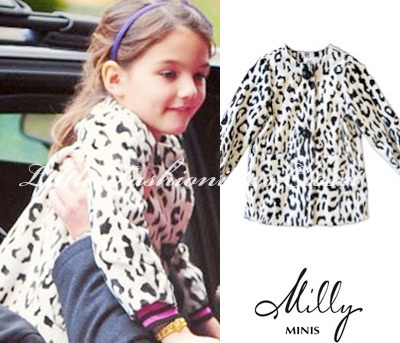 Suri was wearing Addison Faux Fur Coat and Pink Betsy Bow Dress, both FW'12 by Milly Minis. Everyday Deep Violet Leggings by Crewcuts and Red Glitter Minnie Mouse Shoes by Disney. Suri & Katie riding subway to ABC Kitchen in NYC on October 28th 2012. 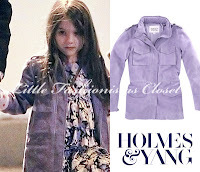 Suri was wearing Joce Grey Dress FW'12 by Stella McCartney Kids. "While most New Yorkers were preparing for the impending storm on Sunday, Katie Holmes ventured out to upscale eatery ABC Kitchen. Joined by a blonde female friend, Suri, another child and a bodyguard – who was seated at the bar as the ladies dined – the Dead Accounts actress was hard to miss. Despite the weather forecast, everyone enjoyed themselves – even Suri! "Suri and her friend looked happy and were having fun," the source adds."